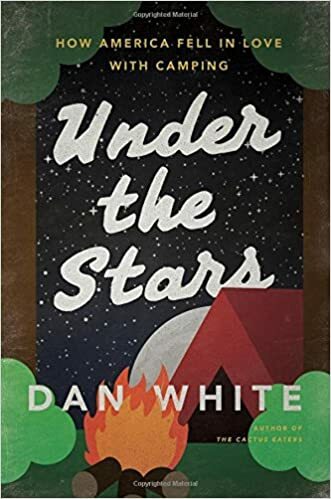 To follow up recent posts about camping and nemophilists, I now present the inaugural Campfire Tales book review, Dan White’s Under the Stars. The book approaches the subject of camping through two widely diverse points of view. The bulk of the book (let’s say “51%,” just enough to hold the deciding vote) is told through stories of historical camping figures (like Horace Kephart), recaps of movements in camping (such as the impact of automobiles on greater access to the wilderness), and so on. There is way more history to camping than you might imagine, and the book is laudably well-researched. Under the Stars includes a wealth of fascinating, obscure stories. Recently, the film Hidden Figures brought to widespread attention an important, rarely told story. While the stories in this book are not all as “important” as that, they are almost all as surprising. I kept asking myself, “Really?” Yes, really. The remainder of the book recounts Dan’s humorous camping adventures. Not reproductions of each historical movement being explored, exactly, but more like homages. If they were movies, they wouldn’t say, “A True Story”; they would say, “Inspired by A True Story.” A note on the humor — it’s not for all tastes. I enjoyed the lightness it brought to what otherwise could have been a dry history lesson and/or a bunch of tall tales. Dan is extremely self-deprecating, and the situations he finds himself in verge on contrived. Most of the time, the humor succeeds, but increasingly as the book continues, the reader’s patience wanes as Dan makes poor choices (note to Dan: If your wife wants to put gas in the car, let her.) and then berates himself when things go wrong. When the humor worked, it reminded me of I Love Lucy. Lucy single-mindedly plunged into scheme after scheme, always to find herself humorously in over her head. That seems to be Dan’s intention, such as when he spends a night in the woods naked. Even so, I kept asking myself, “Really?” Um, maybe. Maybe not. The research. Under the Stars contains extensive notes, bibliography and index. I’ll say it again: extremely well-documented. I also appreciated that the notes weren’t cluttered at the bottom of each page, disturbing the flow of the writing. Instead, they are all gathered in one place for when (or if) one wants to reference them. Thank you for the great future reading list, Mr. White! In Chapter 11, Dan names his philosophy of talking to fellow campers, “Meet Your Neighbors Project.” In other chapters, that friendliness struck me as journalism, all part of writing the book, but to learn that it’s a process he shares with his young daughter was encouraging. In one sense, that’s the impetus behind Campfire Tales (“Tell Your Story”). Personally, I hope to more intentionally implement that philosophy into my life, not only when camping, but also when at work, where everyone hides in their office or cubicle, eating lunch at their desk; when at home, where my neighbors scurry from cars to condos, emerging only to check their mailbox or dump their trash; and so on.